THE fall-out from Sunday’s controversial Scottish Cup semi-final at Hampden has taken a fresh twist with Inverness Caledonian Thistle defender Josh Meekings being issued with a notice of complaint from the SFA’s compliance officer which is set to rule him out of next month’s final. Meekings, who was not penalised by the match officials for blocking a Leigh Griffiths header with his arm during Inverness’ dramatic 3-2 extra-time win over Celtic, has been charged with “denying the opposing team an obvious goal scoring opportunity by deliberately handling the ball”. Inverness quickly rejected the offer of the one-match ban and will defend the charge against the 22-year-old Englishman at a Hampden hearing tomorrow. “The club intends to vigorously defend our player and is taking legal advice on the issue,” said a club statement. “We are extremely disappointed that this has arisen and the player himself is mentally shattered at the turn of events. The imposition of a one-match Scottish Cup ban appears inevitable, however, given the weight of TV evidence and Meekings’ own post-match admission that the ball struck his hand. His only hope of a reprieve will be if he is able to convince the SFA judicial panel it was not deliberate. If suspended, it would be a major blow for both Meekingsand Inverness manager John Hughes, who has already been deprived of the services of his other first-choice central defender Gary Warren for the final against Falkirk on 30 May. Warren picked up his second booking of the tournament against Celtic to trigger a ban. Hughes’ close friend John Collins has called for the introduction of video evidence during matches to avoid the kind of furore which has now affected both Celtic and Inverness in the wake of Sunday’s incident. 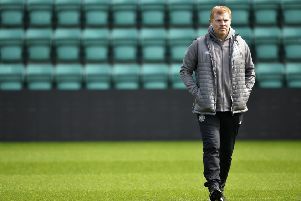 The Celtic assistant manager believes adopting the available technology to assess penalty-area incidents is a “no-brainer”. Collins was the beneficiary of an even higher profile case of handball going unpunished when his intervention on the line helped Scotland earn a 0-0 draw against the Netherlands at Villa Park in the Euro 96 finals. But he insists he has been a long-standing supporter of immediate referral to TV replays in such instances. Collins also believes Fifa’s rule-makers should end the sanction which sees a goalkeeper sent off when conceding a penalty with a foul on a striker, the fate which befell Celtic No 1 Craig Gordon during the dramatic semi-final on Sunday. “I am 100 per cent for using video evidence for incidents in the box,” said Collins. “I always have been. Why? Because it helps the referee, it helps managers and it helps players. “What are the two words we keep hearing [from Fifa]? Fair play. Well, it would become fairer because you have the cameras to use. For me, it’s a no-brainer. “I don’t know what it will take for video evidence to be introduced. That’s for the governing body to decide. “But I think it would be better for football going forward, especially with modern technology. In the old days, it would have taken time but now with the new cameras, you’d get a decision in five seconds. “Yes, maybe we wouldn’t have got that point against Holland in 96 if that was the case, although if they’d scored I’m sure we would have gone up the other end and scored! I could have been sent off that day. But that’s football, isn’t it? The ref didn’t see it or he would have given it. The club intends to vigorously defend our player and is taking legal advice on the issue. Celtic have written to the SFA seeking an explanation for the match officials’ failure to spot the Meekings handball, a course of action Collins says he and manager Ronny Deila played no part in. While Collins was measured and generally philosophical in his own reflections on the issue, he stopped short of rejecting those claims among the club’s support that it wasn’t simply a mistake by match referee Steven McLean and his assistants. “The only person you can ask the question to is the referee and the officials,” replied Collins. “I can’t answer that question. I saw that it was a handball. And once everyone’s seen it on television, it is a blatant handball. “The referee has either never seen it or his linesman’s never seen it and the guy behind the goal’s never seen it.